Queenstown LOTR & Much More Tour – The Great KiwiCombo Pass. See New Zealand your way! The Great KiwiCombo Pass. See New Zealand your way! Brought to you by Linda Jenkins, South Pacific Travellers World. This small group 4WD LOTR tour is a great combination of LOTR film locations, stunning outback alpine scenery and river gold panning. Queenstown and Lord of the Rings are two world-renowned names and when they’re combined in to this half day tour, it’s magic! We explored the highlights and backroads of the Wakatipu Basin by tough, late model 4WD, visiting several LOTR film locations and enjoying the stunning alpine scenery around Queenstown. Amazingly, the tour is quite close to Queenstown and yet a thrilling world away. For adventurous LOTR fans this tour is the perfect combination of visits to several LOTR locations as well as outback 4WD river fording, gold panning and driving remote cliff-hanging roads. 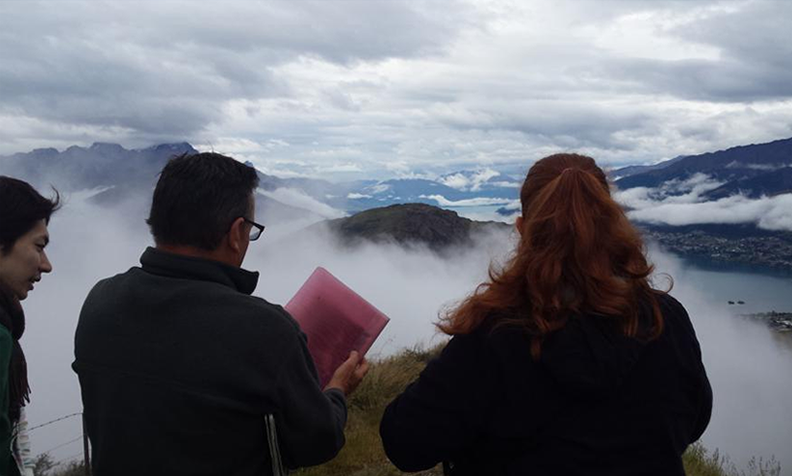 Our small group guided tour departed Queenstown and headed for a remote lookout point overlooking Deer Park Heights and up to the “Misty Mountains”. We saw where the Pillars of the Kings was filmed in the rugged Kawarau Gorge before driving across the Wakatipu Basin to the historic gold mining village of Arrowtown. Here is where the loss of The One Ring at Gladden Fields was filmed. To get to the Ford of Bruinen film location we criss-crossed the Arrow River several times. Clearly the trick is to put the foot down on the peddle, keep moving and don’t worry about the water washing up over the hood! Nature’s carwash! Morning tea was laid out on the afore-mentioned, now clean, hood of the 4WD before we tried our hand at gold panning in the Arrow River. Yes! We struck gold, one flake and several pieces of gold dust. Not exactly a gold rush but a lot of fun. We then headed up the road to Coronet Peak ski area, turning off on to the 4WD road that winds its way into the remote and very spectacular Skippers Canyon. At this stage everyone is hoping not to encounter an on-coming vehicle because passing bays are hard to come by and the sheer drop into the canyon goes down a l-o-n-g way! 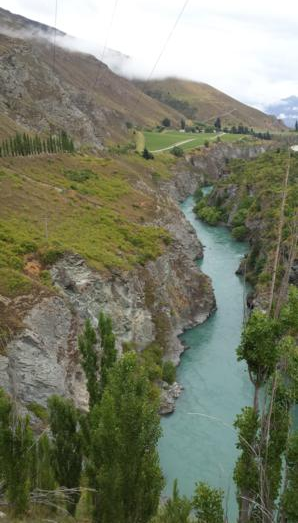 The photo ops of Skippers Canyon and the Wakatipu Basin are amazing. This trip punches above its weight in terms of value, with a winning combination of diverse and spectacular alpine scenery and LOTR film sites and stories. The trip is operated by the very experienced and professional team at Nomad Safaris, departs twice daily from central Queenstown and is away for approx 4 hours. Even for people who have visited Queenstown before, this tour still reveals new dimensions, with an informative commentary about local history, wildlife as well as stories and snippets about the LOTR filming. A lot of fun! For more top sightseeing options around New Zealand. This entry was posted in Lord of the Rings, New Zealand and tagged Coronet Peak, Lord of the Rings, LOTR film locations, New Zealand, New Zealand Self Drive, Queenstown, Remarkables, Travel and Tourism. Bookmark the permalink. New Zealand by Escorted Coach Tour – A Great Way to Go!